Atlanta has won the honor of hosting the 2015 gathering of Nobel Peace Laureates. The summit will be only the second held in the United States and will see over 2,000 delegates, including Nobel Laureates such as former Soviet President Mikhail Gorbachev, U.S. President Barack Obama, F.W. de Klerk, Lech Walesa, Oscar Arias Sanchez, Shimon Peres, and Henry Kissinger. The Atlanta Summit will follow the 50th Anniversary of Martin Luther King’s receiving the Nobel Peace Prize in 1964 and the opening of the National Center for Civil and Human Rights. 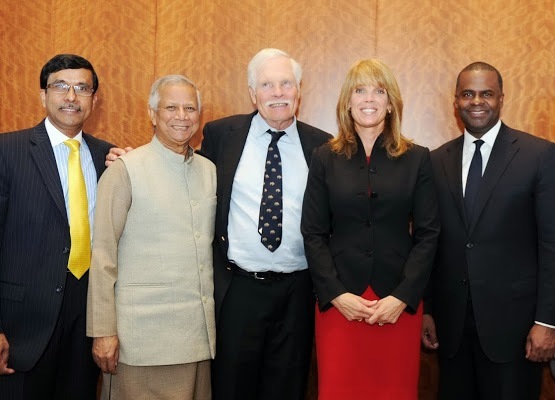 Leading the Summit as CEO is Mohammad Bhuiyan, president and CEO of Yunus Creative Lab Inc.
Bhuiyan worked with 2006 Nobel Peace Laureate Prof. Muhammad Yunus, Ted Turner, Laura Turner Seydel, Atlanta Mayor Kasim Reed (all pictured at right), The Carter Center, The King Center, and others to bring the Summit to Atlanta. Bhuiyan’s wife, Shamima Amin, a chief adviser to the Yunus Lab, is also on the leadership team, as are Host Committee members Duriya Farooqui, COO, city of Atlanta; Pradeep Sinha, surgeon, Atlanta Facial Plastic Surgery; and Palaniswamy Rajan, president, TiE. "Nobel Peace Prize winners bringing 2015 world summit to Atlanta"